Homes for Sale in Green Valley & Green Valley Ranch. 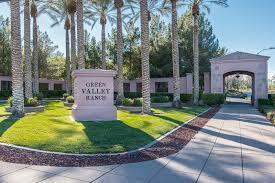 Green Valley Ranch real estate offers another 1300 acres of beautiful homes, biking trails, parks, walking paths, green belts and wonderful schools with panoramic views of the Las Vegas Valley below. With the completion of the District at Green Valley Ranch, the community also offers a fabulous array of upscale stores, championship golf courses, theaters and gourmet restaurants. The newly completed Henderson Community Center is a masterpiece with its amphitheater, library and community pool. Residents also enjoy the close proximity to fishing and boating at Lake Mead and the fact that Henderson was named one of the 50 safest towns to live in. There are approximately 4,000 homes and condos in Green Valley Ranch, divided up into 30 smaller neighborhoods of various sizes and price ranges. Prices can run from mid $100s to over $2,000,000 for luxury homes and condos. Contact Tracy Drown for Real Estate at 702-245-9341. Highly desirable upgraded single story custom home in The Estates at Green Valley Ranch. Iron glass door entry lead to a one-of-a-kind wine room. Travertine w/granite accents & wood floors throughout. Gourmet kitchen has stainless steel appliances and island. Inviting family room & dedicated office w/French doors. Spacious owner suite separate from others. Inviting salt water pool/spa w/water features, Built-in BBQ on over a quarter of an acre. Fabulous location & home in excellent condition! Hickory cabinets w/ crown molding, SS appliances, Large island w/ bar, roll out shelving, granite in kitchen/baths; Pebble tech pool/spa/waterfall. Finished stucco fencing, putting green, water softener, huge master w/ Captains Quarters (den) & deck, 5 BR plus office! Covered rear patio w/ fans, Courtyard entry w/Stampcrete, upgraded iron staircase railing & over $50K in home automation upgrades. Beautiful turn key home in desirable gated community zoned for top rated schools w/3 car garage. Lg private backyard includes serene pool, open floor plan w/surround sound system excellent for hosting. Owned Solar Panel system, new AC units, water heater & carpet on main level. xD; xA; Fresh interior paint, remodeled shower in master, in-ground fertilizer system, updated irrigation system, 3 gas fireplaces, plantation shutters, water softener & more! Breathtaking resort styled home with a modern Tuscan feel-A flawless mixture of fine custom elements & upscale finishes noticed upon entering.Home has over $300k in upgrades & remodeling.Backyard paradise w/full sized pebble tech spa, pool,built in BBQ,alumawood covered patios & synthetic turf.No comparable home in the area!Coveted Green Valley Ranch-Excellent schools, near shopping/dining,The District,recreation/parks,trails & close to I215 hwy.